Press the power button on MacBook Pro, few seconds, we can hear the ring for booting, but the MacBook LCD screen doesn't display, the MacBook screen doesn't has any response. The model for this MacBook Pro is A1502, which was release in 2015, the MacBook motherboard model is 820-4924-A. Here is a solution for fixing this problem. Test the MacBook Pro again. Press the MacBook Pro power button, the MacBook Pro is turned on, because we can hear the booting ring, but the MacBook Pro screen keeps black, it doesn't display. Connect the MacBook Pro to the DC power supply to test the current, there is a charging current. Now we need to disassemble the MacBook Pro. Use screwdriver to remove the screws that fixed the rear case to open it, and then disconnect the MacBook battery. First check the screen flex cable interface to see if here is a water damaged or oxidation phenomenon. Re-install the screen flex cable and test it, but the problem still exists, the MacBook Pro screen still doesn't respond. Next we need to remove the MacBook Pro motherboard to check whether there are some obviously faulty points. Put the MacBook motherboard under the Stereo Zoom Microscope to observe, after checking the both side of the MacBook motherboard, we didn't find the obviously damaged traces. Connect MacBook motherboard to the DC power supply, supply power the motherboard, the current is normal. Directly connect the HDMI to external display, it displayed properly. Seems the problem is on the MacBook Pro screen, remove the MacBook Pro upper part. 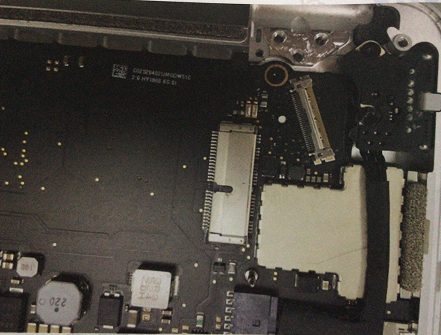 After observation, the screen flex cable interface on the side of the MacBook motherboard has no problem. 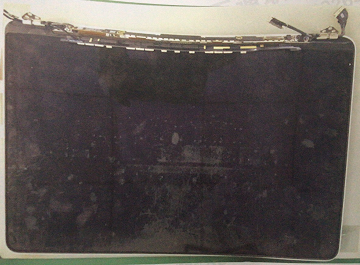 Disassemble the screen shield cover, and then disassemble the antenna，we can see that the screen flex cable interface has a oxidation phenomenon. 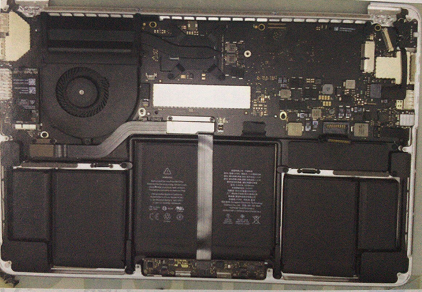 Directly replace the MacBook screen flex cable, and then clean up the flex cable interface with PCB cleaner. After installing the screen flex cable, connect it to the motherboard and test it. Connect the upper part to the MacBook Pro motherboard, supply power to the MacBook, the MacBook Pro screen displays normally. Assemble the MacBook Pro, entering the system to test it, all functions tested are normal, the repair is over!